Daiquiri defenders have a point, given that the burgeoning craft cocktail craze is, in part, a rejection of these and other mass-produced beverages. While the state legislature recently decided to name the Sazerac Louisiana’s official cocktail, the majority of citizens undoubtedly would have chosen the frozen daiquiri, if the question were ever put to popular vote. Despite the honorific nod to the more hoity-toity cocktail, state government has exhibited remarkable ingenuity in sustaining the daiquiri shop business model, in the spirit of non sibi, sed suis, the Latin motto meaning “not for oneself, but for one’s own” that used to appear on Louisiana’s flag. The words referred to the pelican’s sacrifice of her own blood to feed her chicks. In one of the best (or worst, depending on one’s position) examples of public officials collaborating with private interests, our legislators and alcoholic beverage lobbyists have done an effective job of guaranteeing our right to stick our arms through car windows and haul in cups and even gallons of daiquiris. That is, as long as the containers remain “sealed.” According to Louisiana law, this means an “ ‘open alcoholic beverage container’ shall not mean any bottle, can, or other receptacle that contains a frozen alcoholic beverage unless the lid is removed, a straw protrudes therefrom, or the contents of the receptacle have been partially removed.” A few of the several exceptions include “passengers and krewe members riding on a parade float,” as well as passengers riding in hotel courtesy vehicles, taxis, and large motor homes. Violators were once required to pay $50; the fine is now $100. Like watching sausage being made, the legislative history behind the drive-through daiquiri is not as pleasant to stomach as the beverage that state laws seek to protect. No state has done more to make this sugary concoction part of its cultural fabric than Louisiana. From its inception on the outer edges of college campus culture throughout Louisiana, the daiquiri and its drive-through sales outlets acquired many friends in high places, even as many others protested the concept. By the early 1980s, Lafayette and New Orleans, among other cities, had created laws allowing plastic “go-cups” containing alcohol in order to prevent broken glass bottles in the streets. One New Orleanian recalls city police officers distributing “go-cups” emblazoned with the police logo in order to ease drinkers into the new rules. Visitors to New Orleans often marvel over being able to walk down the street while carrying an alcoholic beverage. While that tradition has spread to many “entertainment districts” around the nation, knowledge that drivers can purchase a “closed container” filled with a daiquiri only furthers the curiosity of visitors. Ironically, the emergence of the drive-through daiquiri shop coincided with increasing national outcry against driving while under the influence of alcohol and other drugs. As late as 1982, only 26 states had laws banning drinking while driving. The fatal drunken driving accident that had killed a 13-year-old California girl and inspired her mother to create Mothers Against Drunk Driving (MADD) had occurred less than two years earlier. With heightened attention paid to accidents caused by people driving under the influence (DUI), the concept of a Lafayette bar known as the Daiquiri Factory attracted the national media. Drivers could “pull up, grab a drink through the window and roar off without leaving the car,” according to one 1982 Associated Press article. Soon after the article was published, one Kansas newspaper editorial predicted that not even Louisiana would allow such a practice to stand. Local as well as national commentators responded to what was most likely the first such business in Louisiana. A prefab metal building that more resembled a snowball stand than a bar, the Daiquiri Factory was located only yards beyond city limits, making a legal response even more challenging. Traffic delays and accidents owing to the novelty of the drive-through shop generated complaints to Lafayette officials, and police began issuing citations. These included driving on the shoulder as many cars bunched up, their occupants waiting to enter the drive-through lane. Forty motorists were ticketed for traffic offenses in one June 1982 day dedicated to celebrating the business’ six-month anniversary. Founder David Ervin interpreted the police actions as harassment of his customers, and he responded by seeking a restraining order. A new Lafayette law forbidding open containers of alcohol in “moving vehicles” caused Ervin to insist that his containers were sealed because the lids were taped to the foam cups. Ervin was among the first to argue for the legal interpretation of a flimsy lid as equivalent to a distillery’s seal on a liquor bottle. Quite a bit of Louisiana cultural history rests on that interpretation. Purchasing alcohol via drive-through windows was not the innovative aspect. One could purchase beer and other capped or corked beverages via drive-through windows in Ohio and elsewhere. A chain of Texas shops known as Eskimo Hut claims to have been selling daiquiris in such a manner as early as the 1970s in its Amarillo location, but these never have been allowed to contain hard liquor. According to the Texas Alcoholic Beverage Commission, the beer retailer’s permit only allows for the sale of “to-go” margaritas or daiquiris concocted with wine or beer, rather than with distilled spirits. Since 2001, another Texas law has required vendors to “heat seal” each daiquiri within a plastic bag, a legal maneuver that would strike most Louisianans as nanny-state intervention. Our citizens are trusted not to pierce the plastic lid with a straw when transporting the beverage, while Texans require double the security measures. 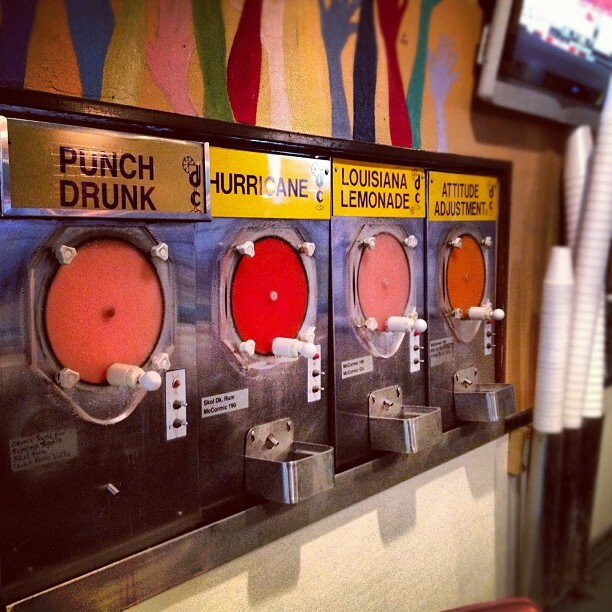 Frozen daiquiris in Baton Rouge. Photo by Corey Taratuta. Louisiana’s distinctive practice of handing a customer a straw and a “closed container” evolved over time, and not without skirmishes along the way. When the city council of one New Orleans suburb debated the need to clamp down on “open” daiquiris in automobiles, one civic-minded young man argued, “You’re messing with our culture.” Government officials certainly were pruning back a new tradition, which is why another customer developed her response: “I keep an unused straw in my car. If I get stopped, I just whip out the used one and show them the new one. Looks like a closed container then.” Her scheme might work, as long as the police do not check too closely for “hanging chads” on the lid. The bedrock upon which the drive-through shops were allowed to flourish is found in the lobbying efforts of the Beer League of Louisiana, which for decades had worked to keep liquor taxes low and state regulation to a minimum. The mastermind at the center of the liquor lobby for the last few decades of the 20th century was George Brown, who also directed the Louisiana Wine and Spirits Foundation for a long while. Regarding the open container loophole for “frozen alcohol,” Brown candidly recalled in 2003, “We did it for one of our friends” in the daiquiri business. The league had accomplished a number of goals, including a 1988 effort to quash plans for introducing can and bottle redemption via a five-cent deposit. Brown had convinced legislators that such a reform could cost the liquor and beverage industry as much as $100 million per year. Environmentalists promised they would eventually persevere, but Brown proved an immovable obstacle. His earliest lobbying efforts started in the late 1940s for the Beer League. While still a legislator representing Ouachita Parish in the mid-1960s, Brown had tangled with fellow legislator and New Orleans grocery store magnate John Schwegmann as the latter fought to end price-fixing in the wholesale liquor industry. During the 1970s, Brown favorably impressed legislators when he refused to reveal which one had taken $15,000 from the Dixie Brewery, handed over, via Brown, as a “campaign contribution.” Brown served 6 months in prison in 1981 (for not having paid taxes on the $15,000) rather than snitch on the legislator. He reemerged to find an enhanced reputation as a selfless lobbyist as well as a changing climate regarding the dangers of impaired driving. Many states acquiesced on the 1986 National Minimum Drinking Age Act and quickly raised the legal drinking age to 21 while Louisiana legislators let things ride. In 1987, Louisiana finally gave in to pressure from the federal government and raised the drinking age from 18 to 21. However, the legislators made certain that the change would not take effect until the very last day before federal highway funds were to be withheld from states refusing to cooperate. An important loophole allowed those under 21 to enter bars, but they were not supposed to be allowed to drink alcohol. Further, bar owners were protected from lawsuits if 18- to 20-year-olds happened to be served liquor. The laws were tightened up in 1995, but the next year a court challenge argued that the raised drinking age was a form of age discrimination. The Louisiana Supreme Court ruled 4-3 in favor of the plaintiffs, so for a short while, 18- to 20-year-olds and bar owners celebrated Louisiana being the sole state not holding to the national minimum age. Pressure from federal and some state officials eventually convinced Louisiana to rejoin the Union on this issue. 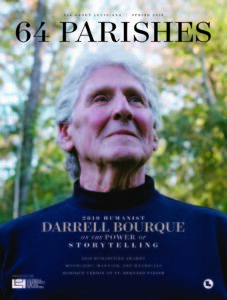 In a four-year span beginning in the late 1980s, one Louisiana woman had lost two daughters and one stepdaughter to drunk-driving accidents. In all three instances, her children had been victims of DUI drivers, not perpetrators. To assuage her grief, the mother joined the Louisiana chapter of MADD and steeled herself for a 1993 appearance before a legislative committee debating relatively lax enforcement of the state’s drinking age laws. Some of the committee members conversed amongst themselves as she shared her heart-rending stories, and a couple left the room while she testified. The same legislators paid close attention when the liquor lobbyist countered her arguments. The general strategy of killing legislation before it could leave committee worked once again. Following the session, one of the legislators invited the MADD representative to accompany him to a party. ”I couldn’t believe this guy was coming on to me,” she recalled in a newspaper interview. Not always heartless, Brown, a registered Methodist minister, once performed a marriage ceremony in the Governor’s mansion when Edwin Edwards resided there in the 1980s. Brown officiated at the wedding of Mike “Beachball” Russell, an Edwards appointee who was serving as the Assistant Secretary of the Office of Alcohol & Tobacco Control. While many like to think that the drive-through daiquiri symbolizes laissez-faire attitudes and government, this illusion would not have been possible without the vigorous work of lobbyists and legislators. The obvious question is just how hazardous does the daiquiri anomaly make Louisiana in terms of DUI arrests and automobile accidents? In 2000, according to figures compiled by MADD, 48 percent of all 454 Louisiana traffic fatalities were tied to alcohol; only five other states had a worse record, but those ones had fewer total accidents. In 2004, the state legislature passed the law making it illegal for passengers to have open containers of alcohol. Louisiana continues to rank among the top when insurance companies survey the nation’s worst drivers. For two years in a row, Louisiana has ranked as the worst according to one study. The numbers reveal one bright spot: careless driving and failure to obey traffic signals while sober have far more to do with the ranking than drunken driving; our state ranks only 38th worst in the latter category, leading the study authors to label it our “best ranking factor.” Let’s keep up the good work. Michael Mizell-Nelson, Ph.D., was an associate professor of history at the University of New Orleans. New Orleans generates most of the attention when discussing the emergence of the frozen daiquiri as a cultural phenomenon, but the college towns of Ruston, Lafayette, Lake Charles, and Hammond all offered mass-produced daiquiris before the Crescent City.